OliveSeon is known for great cityscapes; Mothra attack has to be one of my favorite builds ever. The latest creation, City and Dockyard is a little more tame than some, but still features some incredible detail and great mix of modular set building and unique creation. I really enjoy the peek beneath the water, the translucent blue walls is a great way to do that. The base of the ship assembly crane is pretty impressive. Nice use of the monorail track to make this thing mobile. Some figs painting the ship. On the back side, we get to see the impressive bridge work and subway tunnel. 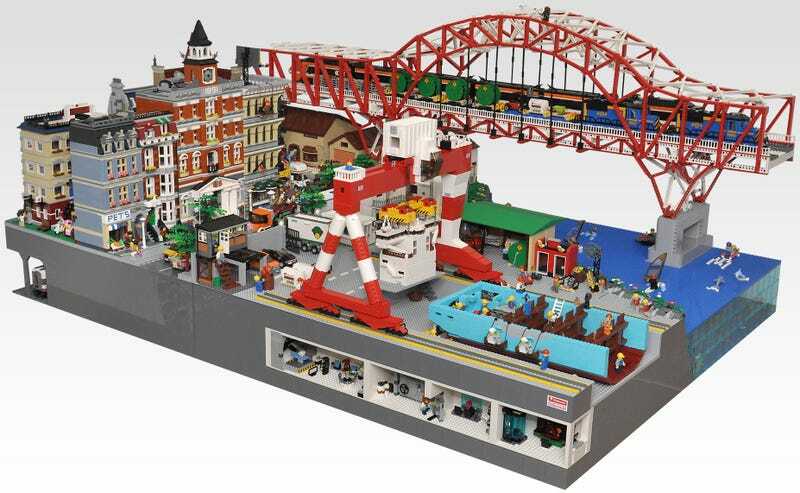 On the far right, we get just a glimpse of Bike Shop & Cafe (31026) sets that have been modified into modular buildings. Also notice that the Palace Cinema (10232) has been increased by one story. The Simpsons House (71006) is hiding out under the bridge. This angle gives you a better look at the submersible and the great rock work in the bay. Family House (31012) also sits under the bridge. We can add this diorama to the already impressive list of other builds of this nature. These are wonderful displays and I can't wait to see the next one.